Swaziland’s King Mswati III has chosen an 18-year-old beauty pageant contestant as his 15th wife, a palace spokesman said Tuesday, days before a much-criticised parliamentary vote. “I can confirm that the king has introduced to the nation a new liphovela (royal fiancee),” said Ludzidzini palace governor Timothy Mtetwa. Mswati, a 45-year-old who is sub-Saharan Africa’s last absolute monarch, introduced Sindiswa Dlamini at a Reed Dance celebration over the weekend, Mtetwa told AFP. She wore red feathers on her head — a sign of royalty. The young woman graduated from Mbabane’s St. Francis High School last year and is a finalist in the Miss Cultural Heritage beauty pageant. The winner will be announced on September 28. The king has come under fire for his household’s lavish lifestyle while the tiny mountain kingdom’s 1.2 million people struggle to make a living. Mswati reportedly has a personal fortune of around $200 million (152 euros) and the UN estimates that 70 percent of his 1.2 million subjects live below the poverty line. The weekend’s celebrations were a smaller repeat of last month’s official annual Reed Dance, where young virgins from across the kingdom gather and dance for the king. “It just happened that the international community was there to witness the event,” said Mtetwa. The wedding only takes place once the fiancee falls pregnant. 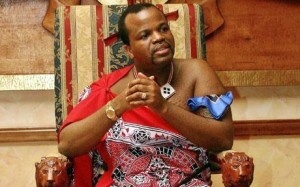 Dlamini will then become Mswati’s 14th wife. The monarch’s colourful private life is off-limits in local media, but has drawn a lot of international interest. Mswati had kidnapped and married the queen when she was 16 in 2005.